Drafting and signing of Prenuptial and Postnuptial Agreements in Bali and Indonesia. Let us guide you through the process of signing a prenuptial or postnuptial agreement in Indonesia. 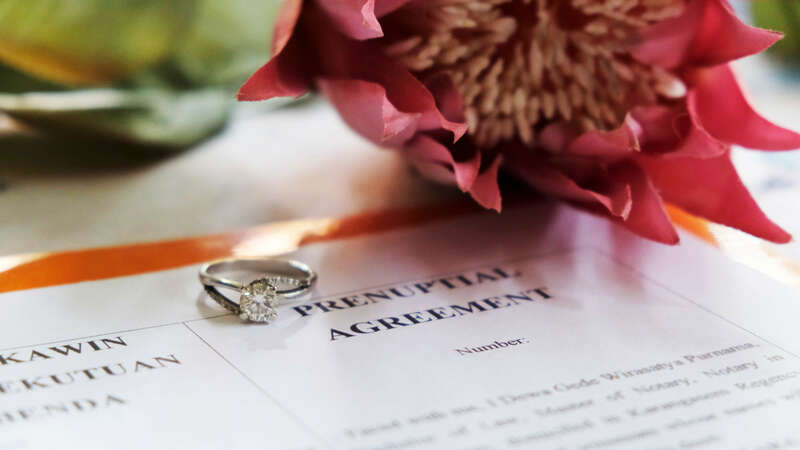 The most common reason for signing a prenuptial agreement in Indonesia is for a mixed marriage couple who would like to ensure the property ownership rights of the Indonesian partner. Based on Article 3 of Peraturan Pemerintah Republik Indonesia Nomor 103 Tahun 2015; Indonesian citizens who are married to foreigners can still hold property rights; however, there must be a proven separation of assets form that is in the format of a Notarial Deed registered at the Civil Registry Office along with a Marriage Certificate. The content required and the process of registering your prenuptial agreement will vary slightly based on the regency in which your marriage will be registered. However, there is some leeway in the content of your agreement. As this is such a personal topic, we usually recommend a consultation with our team to determine your goals and inclusions in your agreements. For those who are already married and have not yet processed a prenuptial agreement, there are remedies still available. Before 2017 Postnuptial Agreements were not legal in Indonesia. However, on May 19, 2017, the Indonesian Ministry of Home Affairs issued a clarification of the Constitutional Court Decision No. 69 / PUU-XIII / 2015 dated October 27, 2016 by which Article 29 of the 1974 Marriage Law was declared unconstitutional. This clarification regarding the registration of Postnuptial Agreements is in the form of a letter concerning the Recording of Reports of Marriage Agreements No. 472.2 / 5876 / Dukcapil dated May 19, 2017 addressed to the Heads of the Departments of Population and Civil Registry in Regencies and Cities across Indonesia. This letter recognizes the legality of Postnuptial Agreements for the separation of assets, therefore the Postnuptial Agreement is made in the form of a Notarial Deed and registered with the local CAPIL/Marriage Registrar. Thus, making a postnuptial agreement legal by The Laws of Indonesia.